I really should start off by saying that Giles is a friend of mine, and therefore I am not in a position to be able to write a totally unbiased review. What I would though like to do is discuss Giles’s book, as it is so in keeping with the philosophy of Transition Consciousness and also my professional work in business consultancy and teaching. The Nature of Business: Redesigning for Resilience is published by Green Books in the UK, and launches in September of this year. At its heart the case is presented for transformational change in business, from the old paradigms of exploitation, waste, and unlimited growth, to a new business paradigm that at one and the same time both respects nature, and is also inspired by nature. Regular visitors to my blog will be well aware of this picture, which shows the three main pillars which I teach. Ultimately, we do need new business models to cope with our complex world, and these new business models can be inspired by systems models, and in particularly systems models from nature. In order to really understand these new systems models, we need to change our current way of thinking, and that means changing our underlying mental models of the world. …the business paradigm of the firm of the past reinforces its own mentality through this focus on managing rather than leading, on personal excellence rather than team excellence, on risk mitigation rather than exploring new ways of operating to create additional value. Unfortunately, this business paradigm makes a rod for its own back, and life within the firm of the past becomes increasingly stressful as demands for improving on last quarter’s earnings endlessly continue, while relentless bottom-line management results in reduced investment in value enhancement capabilities. Ever-decreasing capability of long-term growth is the cost incurred for singular focus on short-term profit maximisation – focusing on today’s harvest at the expense of sowing fewer seeds for the future. Sooner or later the future becomes the present, and it becomes harder and harder to maximise short-term shareholder returns with this business mentality. Rather than being divided into chapters, the book is divided into modules, which have been written to offer as much practical advice to the business practitioner as possible. This I feel represents a huge step forward from other books written on the topics of natural systems, which have been aimed more at the scientific communities than business communities, the result of which has been business imply responding “so what” when reading these texts. Many students of mine have asked me about what they can now read, and I shall certainly be recommending The Nature of Business. 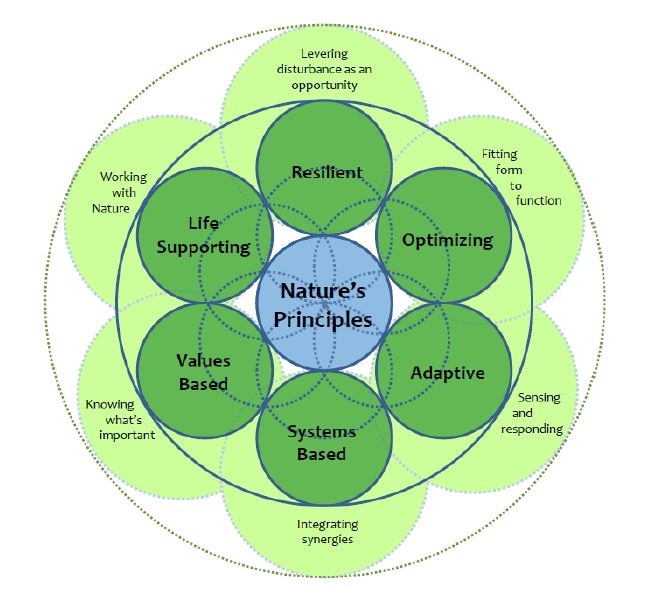 The following diagram of Giles really represents best the heart of his work, and highlights the six key principles of how nature conducts its business. If we think of nature as the ultimate business guru (I really am no fan of this term “business guru” mind), then this is what nature would be teaching us. Good business sense is creative, fun and opportunistic. Good business sense improves the individual, the organisation and the wider stakeholder community and environment. The daunting challenge of becoming a firm of the future can become an exciting opportunity; a path that once found becomes the only right path to follow. People are always asking me what my influences are, and I drew this diagram to show people the lineage of thinking in business and science that I strongly resonate with. At the top are many well-received business strategy books, such as those of Peter Senge, Otto Scharmer, Arie de Geus and Thomas Johnson. 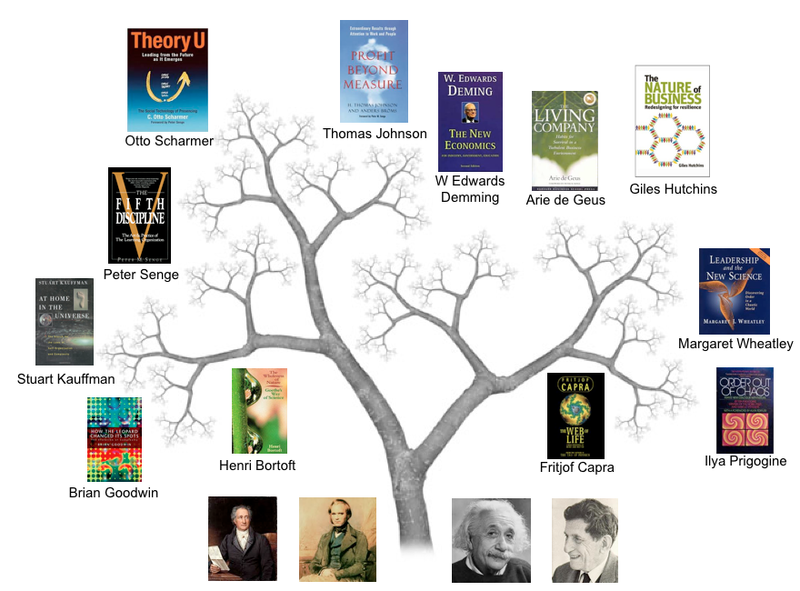 To really though understand what these authors are saying, it helps to have a grounding in the new sciences of chaos and complexity theory, and this is where authors such as Henri Bortoft, Fritjof Capra, Brian Goodwin, Margaret Wheatley, Ilya Priogine, and Stuart Kauffman come in. Giles covers much of this new science in his new book, which will provide the perfect foundation for exploring each of the ideas discussed in more detail, should you wish to do so. Underlying these modern thinkers are Goethe, Darwin, Einstein and Bohm, some of great scientists and philosophers who have really helped me the most in the transformation of my own mental models, leading me to understand order and chaos, complexity, variation, emergence, cause and effect, and the relationship between our intellectual way of thinking, seeing, intuition and feeling in a far more dynamic and organic way of thinking. Henri Bortoft calls this the dynamics of seeing, and it is to understand systems in an authentic and not a counterfeit manner. In writing The Nature of Business Giles has provided the business community with a hugely practical book which is succinctly able to make the case for transforming ourselves and our business strategies to being more in tune with nature, and provides us with the tools and case studies to help us achieve this. Giles Hutchins is a business change agent with over 15 years of business and IT transformation experience with KPMG and Atos International. His passion is exploring ways of applying nature’s inspiration to sustainable business transformation. His work draws on a range of theories and practices (such as biomimicry, cradle-to-cradle & industrial ecology) applying them to the challenges businesses face today, providing practical insight and guidance to help businesses redesign for resilience in these volatile times. He is the co-founder of BCI: Biomimicry for Creative Innovation. Giles regularly guest lectures at leading universities, presents at global conferences and blogs for a number of sustainable business sites. I do not think a man that does not own his own business or has the lifestyle he seems to pocess”.. Should really be writing a book .. Is this book on growing weed ??? As that’s what it seems like”… Well it will make good toilet paper”.. Don’t waste your money !!!! Thanks for your comment. In the name of free speech I try and approve as many comments as possible. I have to say though, I do not really understand what you have written.